Effective spoken communication requires being able to express your ideas and views clearly, confidently and concisely in speech, tailoring your content and style to the audience and promoting free-flowing communication. Persuading and Negotiating Arriving at an agreement that is agreeable to both sides: a win:win situation. Back up your points with logic. Show tact to those you disagree with. Making a speech in front of an audience: presenting your message in an interesting way, structuring your presentation, using audio-visual aids effectively and building a rapport with your audience. Ask for help when you need it. Research suggests that asking for help with something (within reason) makes you more liked by the person you ask! Good listening has an enormous quality of nowness. Helpful listening is a form of meditation. 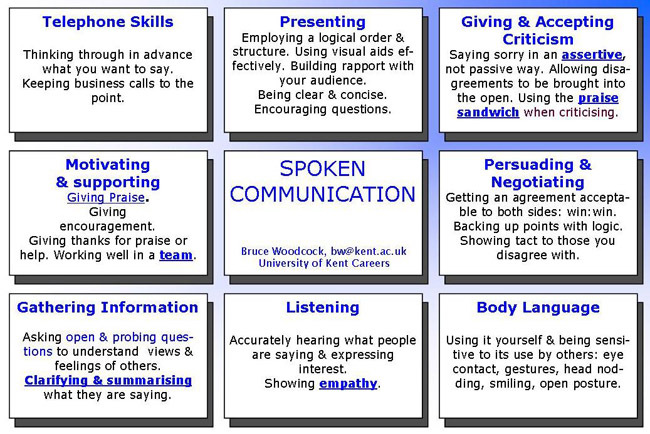 Make effective use of body language and speech. Be sensitive to the other person's body language as well as what they say: eye contact, gestures, appropriate humour and analogies. Use appropriate body language yourself: face the person with an open, attentive posture andmaintain good eye contact (look at the speaker a lot, but don't stare all the time), smiling and nod your head from time to time. Listen attentively. Express interest in what people are saying and don't interrupt them. Be aware of any prejudices or misconceptionsyou or the speaker may have. Good listening builds a rapport and understanding with the speaker and allows them to freely express their views. It motivates them to say more. Poor listening makes assumptions, creates resistance and hostility, demotivates the speaker, inhibits their development and creates dependence on the listener. These reflect back what the speaker is saying in other words to clarify understanding: you paraphrase and repeat back key points. They may summarise and bring new interpretations to the speakers words. They show you're listening carefully and checks you are understanding correctlywhat they are saying allowing the speaker to confirm or correct your feedback. They encourage the speaker to elaborate and to define their problems. It is often the most useful way of giving positive feedback to someone: "I hear what you're saying and take it seriously". You can't keep saying "uh-huh" or "yes" for too long without it sounding false. People with a musical quality to their speech (a big variation in pitch and rhythm called prosody) tend to be more empathic. Lisa Aziz-Zadeh of the University of S. California found that people whose speech is most intonated, lilted or "sing-song" have more ability to empathise with others and to convey emotion. Empathy means being open to the ideas of others and sensitive to their values and feelings: trying to see things from the other person's perspective. Each individual has a unique perspective which should be valued. We each occupy our own private world and never completely know what's going on inside other people's minds. Be prepared to disclose your own feelings and beliefs to encourage others to do the same: be open with other people. Demand simple yes or no answers with no chance to elaborate. Limit the gathering of information, fail to explore possibilities and get overly simple answers. They typically start with: Could ..? Couldn't ...? Should ...? Would ...? Have ...? Are ..? Is ...? Will ...? They can sometimes be useful for quick checking of factsor to show that you have been listening carefully to the other person: "Now if I understood you correctly you meant that ...."
"Are you poor at exams?" These are similar to closed questions. "You're bad at maths aren't you?" These can sometimes be good for analysis but may demotivate the interviewee from talking. They require longer, more detailed detailed answers, produce more, better quality information and open up possibilities. They help the person crystallise their thoughts and help you to understand their views, feelings and attitudes. They may start with: How ... ? When ....? Where ....? What ....? Which ....? Why ....? Who ..? What ...? If ....? "Tell me what you think about this?" These delve more deeply into the interviewee's answers, and allow you to dig down to reach the important information. "Tell me exactly what your duties were at Bloggs & Co."
These are hypothetical questions These questions are used precisely because it's impossible to work out your answer beforehand, thus it tests your ability to think quickly, and reason logically. "How would you deal with a staff member caught stealing a packet of biscuits from the shop?" They show you're listening carefully and checks you are understanding correctly what they are saying allowing the speaker to confirm or correct your feedback. If I heard you correctly, you felt very angry about the way you had been treated? These questions are provocative. Often, they reflect the opposite view to the real view of the questioner and can lure out any hidden prejudices you may have. "I think that the Government has made some really stupid decisions recently: don't you agree?" If you have a difficult or complex question, introduce it first with "I know this will be tough to answer so please take your time". This is more likely to elicit a considered response and doesn't put the other person on the defensive. Ask your question and try to stay silent until you get an answer: the longer it takes to get answer, the more powerful the answer is likely to be. Ask yourself exactly what you want to gain from the conversation: a lack of clarity can lead to confusion and poor decisions. Asking clarifying questions: "How? ", "Why? ", "When? ", "Who? ", "What? ", "Where? ", will help the other person crystallise their thoughts. Summarise the main points in simple language. Get the other person's agreement that your summary is accurate. Define the problem and then move the focus to the solution: separate the points that relate to the problem and those that relate to the solution. A survey of managers by the Institute of Leadership found that the most most irritating jargon/management speak phrases were "thinking outside the box", "going forward" and "let's touch base", so try to avoid such phrases when applying for jobs. Use simple words and clear unambiguous language. Be succinct: take time and effort to distill ideas to an absolute minimum. Make simple points that everyone agrees on. Graduate transitions facilitator Careers adviser! Use the active not passive voice. "I will send it to you" rather than "It will be sent to you". NOT: "We need to incentivize our best of breed to think outside the box in focusing our core competencies on mission critical key deliverables." BUT: "We should motivate our staff to use their skills on important tasks". Feedback has also been called constructive criticism. Only give feedback if the gain will exceed the pain: only use it for important things. Praise more than you criticise! Identifying and developing strengths is more effective than focusing too much on negatives. Constructive criticism which shows the person how they can improve. Not "Debbie was hopeless! ", but "Debbie made some very useful contributions but her voice was a bit quiet. I couldn't hear her very well, so she needs to raise her voice a bit in future." It's a good idea to ask permission: "Do you mind if I give you some feedback?". This gives the person time to prepare. Try to give feedback immediately: on the spot if possible: it's most effective when fresh in the person's mind. The more quickly it is given the more relevance and power it will have. Be direct and honest. Get quickly to the point, don't have long and embarrasing introductions, although starting with some genuine praise based on what the person has actually done will help (see the praise sandwich below). Give feedback in private if at all possible, it's insensitive to do this in front of others. Stick to a single clear issue, don't pack in too much criticism as this can be disheartening. Don't repeat the same point over and over: this will just build up resentment. Only criticise behaviours that can be changed: "You need to improve your computing skills" rather than "You're stupid"! Give feedback on a person's behaviour not about the person themselves. Give accurate descriptions of behaviour not comments about the person's qualities and worth as an individual: "You have been late for work a lot in the last month"rather than :"You're lazy"! Don't compare the person with other people, as this can build jealousy: "Jane is always punctual"
Use "I" not "You" statements: "I feel upset" not "You made me feel upset". Use specific examples. Don't say "You're hopeless at this", say "We need to give you training on how to do this"! Stick to facts: describe behaviour but also what happened as a result. The best decisions are those people reach for themselves. Try not to tell the other person directly what they should and shouldn't do. Let them explore their behaviour and say themselves what needs to be done. This avoids the build up of resentment. Allow the criticised person to express any concerns they may have. Use tentative words such as "sometimes" and "perhaps" rather than "always"and "never": these allow the other person to avoid argument by saying that "always" is not strictly true. At the end, Check understanding: "Does what I've said make sense to you?" and summarise what you've agreed. Talk openly about your own concerns if necessary. First make a positive statement to the person: "I think you are really trying your best"
Then the criticism "But you need to structure your essay more logically". Make another positive statement to finish "However it's a very good first attempt"
There are two types of people who don't say much: those who are quiet and those who talk a lot. If you are recieving feedback youself, try to accept it in a positive and non-defensive manner. Tell people something they have done that you likeor what you like about them. Give them thanks if they have done something for you. Even a simple thank you can make a big difference. Give encouragement. If someone is not sure that they are able to do something, give them encouragement if you think they can do it. Describe positive behaviour and it's effect in concrete terms "I really appreciate how you took the time to ...."
Respond to praise by thanking the person. Is concrete and specific. It says precisely what the other person is doing wrong e.g. "Your CV is 3 pages long, you need to reduce this to two pages." Is vague and abstract. It makes the person angry because the person is not told how they can change things. It talks about actions and says what people are doing rather than what they are e.g. "You dance really artistically" not "You're fantastic." Labels people: "You're stupid"
Is given immediately: not hours or days later when neither of you can remember what happened. May be delayed: by the time it is given, the person may have forgotten what you are talking about. Being able to say sorry if you have done something wrong, but in an assertive rather than a passive way. A study at the University of Utah found that if you ask someone why he is friendly with someone else, he’ll say it is because he and his friend share similar attitudes. But if you actually quiz the two of them on their attitudes, you’ll find out that what they actually share is similar activities. We’re friends with the people we do things with, as much as we are with the people we resemble. We don’t seek out friends, in other words. We associate with the people who occupy the same small, physical spaces that we do. Researchers at the University of Arizona & Washington Universitytracked conversations of 79 students. They assessed how many conversations were trivial and how many substantive, based on whether the information exchanged was banal: “Hot today isn't it?” or more serious: “I'm really worried about her relationship with him ...”. The happiest subjects spent 70% longer talking than the unhappiest ones, which suggests that “the mere time a person spends in the presence of others is a good predictor of the person’s level of happiness”. The happiest participants also had twice as many substantive conversations and only a third as much small talk as those who were least content. Should be two way with both parties equally involved and interested. It is a shared experience. It is a partnership like a dance: you respond to each other's movements and are both winners. Build them around respect: treat other people the way you want to be treated yourself. The atmosphere should feel comfortable: like plants, conversations need good ground to take root and flourish. Talk about mainly positive things. People who talk about good news tend to cheer people up whereas people who always talk in negatives tend to depress the people they are talking to! Obviously there must be a balance, as sometimes we must talk about unhappy events, but make sure you don't do this too much. You wion't go far wrong if you use the old adage: "If you don't have anything nice to say, don't say anything at all!" There should be a willingness to be open on both sides. Each person has the opportunity to express their point of view and feelings. Relationships develop through conversations where we open up and exchange details to create closeness. Always address someone by their first name if you know this. It shows that you are treating them as an individual. A good conversation makes a difference; something useful happens and it has a satisfying conclusion. Nod your head from time to time to encourage the speaker. Leave spaces: stay silent for a few seconds. Don't talk for too long: our attention only lasts a few minutes before we need a break. Cut your story into bite sized chunks to allow breathing space. Make descriptions specific: don't generalise or use clichés. Be precise and concrete. Ask the speaker to elaborate on major points. Regularly summarising can improve the quality and accuracy of your conversations. Feed brief summaries back into the conversation. When starting conversations show that you value the other person's attention: "I'd really like your opinion about ....."
We make guesses and assumptions rather than listening properly. Assumption is the enemy of good communication; we assume that the other person is just like us. Avoid prejudice and presumption. Similarities between people make communication possible, but differences make it worthwhile. We score points off each other and apply pressure. Our opinions and feelings are denied: we feel under attack, ignored, patronised, put down and threatened. "The hindrance thrown in the way of a very speedy intimacy .... prevented their doing more than going through the first rudiments of an acquaintance, by informing themselves how well the other liked Bath, how much she admired its buildings and surrounding country, whether she drew, or played, or sang, and whether she was fond of riding on horseback." Begin with light topics such as the weather and later move onto more serious topics. If the listener doesn't want to speak they will nod or break eye contact or say something like " uh huh" or "yes"
Research found that what you say about others reveals as much about about you as the person you are describing. A person's tendency to describe other people in positive terms is an important indicator of the positivity of the person's own personality. Students who rate their peers positively were found to be trustworthy, nice, enthusiastic, happy, kind-hearted, courteous, capable and emotionally stable. They reported greater life satisfaction, less depression, better grades and were more liked by others. They were seen as being agreeable and conscientious. Women tended to rate others more positively than men. Those with negative opinions of others were more apt to be disagreeable, antisocial and narcissistic and were more likely to be depressed and to have personality disorders. “You stand to learn a number of things about a person from just observing whether the person describes others positively or not. Your words could reveal a lot about your own personality traits.” said Dustin Wood, assistant psychology professor. Dustin Wood, Journal of Personality and Social Psychology, 2010; vol 99: pp 174-190. Here are answers to the sort of question you might get on application forms or at interview to test your communication skills. Joining a campus drama group. Getting involved in a debating society. Can you give me an example of a time when you have had to argue your case and convince another person of its merits? I had a lot of trouble managing my finances during my first year at University. I ignored the first couple of letters from the bank manager but eventually I had to meet her to explain the situation and persuade her to let me run quite a large overdraft until the end of the academic year. Before I went to see the bank manager, I drew up a cash flow forecast to show how I would economise through the rest of the year & how much I would still need to spend on essentials. I also found a job in a pub for two evenings a week. The bank manager was very impressed with my figures and let me have a larger overdraft than I'd expected! With my part-time job and another job in the summer vacation I managed to pay off the overdraft by the start of my second year. I won't say that I've never been in debt since because its quite hard to manage as a student, but I've never let my finances get out of control again. I have been involved with the Parent-Teacher Association at the local primary school since my elder son first started there. The PTA organises a number of fund-raising events which have involved me in persuading people to buy raffle tickets, display posters in shop windows, donate prizes, etc. Three years ago, the PTA produced a book to mark the school's 25th anniversary and, as a member of the editorial committee, I helped to decide on the content and format of this book. The school governors wanted an "official" history, but I represented the PTA in arguing that a collection of reminiscences of past pupils would be more readable and saleable. This was agreed and we then contacted ex-pupils through mailshots based on old school registers and features in the local newspaper and on local radio. The response was excellent and the only problem was in sifting and editing the letters we were sent. persuaded local shops of all kinds (not just booksellers) to sell the publication. See our competencies page for more about how to answer these types of question.